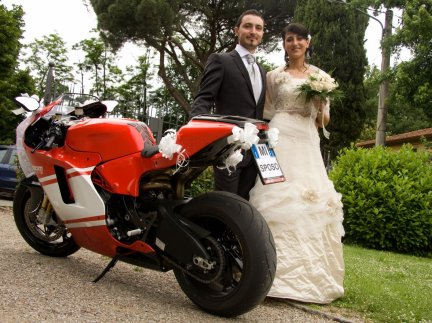 Ducati dealers of Arezzo and Florence, Italy decided that a Desmosedici would make the perfect wedding gift for their friend. The note on the gift said something like: ”In all the tales a happy ending is when the Prince shows up from horizon on his beautiful white horse to take his princess”, we made them 200 horses. I would definitely get married if my friends gift me such a gift. I would get married if my husband was gonna get that. I would and you would…any rich friends that would?